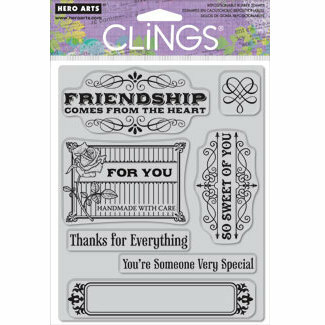 From the Hero Arts 2012 collection, this Cling stamp Set contains 7 different images including a frame, a flourish and the words "Friendshop comes from the Heart", "For You...Handmade with care", "So Sweet of you", "Thanks for Everything" and "You're someone very special". The stamps are set on a sheet sized approx. 5 x 7 inches.